After close games like Wednesday night’s Miami Heat–Boston Celtics Eastern Conference Finals Game 2, analysts usually want to dissect the plays run on offense. But Miami almost lost and ultimately won this one as a result of their defense. Toward the end of regulation, Ray Allen got an open 3 because of Miami’s defensive breakdown, and then in overtime, the Heat forced a turnover to clinch the win. Let’s look at those two possessions. The Heat were up by three points with 47.7 seconds left in regulation following a Boston timeout. It was pretty obvious that the Celtics would look for a quick 2 or a 3 to preserve the two-for-one option, allowing themselves a second chance to score. 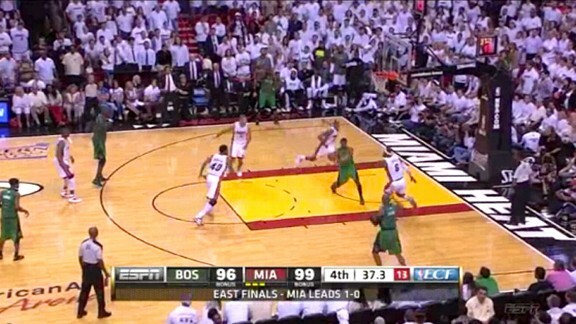 Miami needed to make Boston work for the shot. If they could force Boston to use the entire 24-second clock, Miami would be guaranteed the final possession (barring a turnover). We pick up the play after Keyon Dooling has set a screen for Kevin Garnett, who is now on the wing and free to receive the ball from Allen. 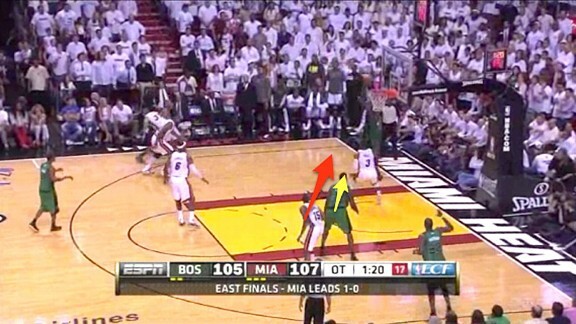 After Allen inbounded the basketball, he set a pin-down screen for Rajon Rondo. 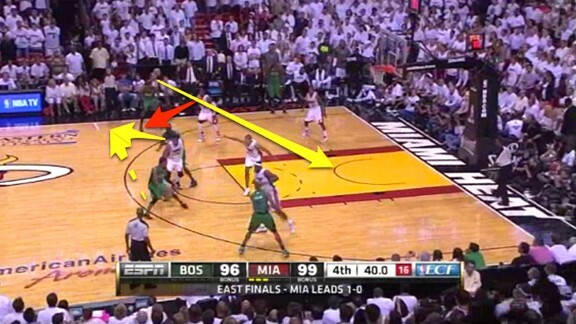 Miami makes a number of switches, so LeBron James began guarding Rondo but now guards Allen. Garnett hands off the basketball to Rondo, and again Miami makes a switch: Udonis Haslem picks up Rondo while Shane Battier picks up Garnett. Haslem forces Rondo to pick up his dribble, but Rondo gets the basketball back (from the hand-off) and Garnett sets a ball screen for him. That’s where we pick things up now. 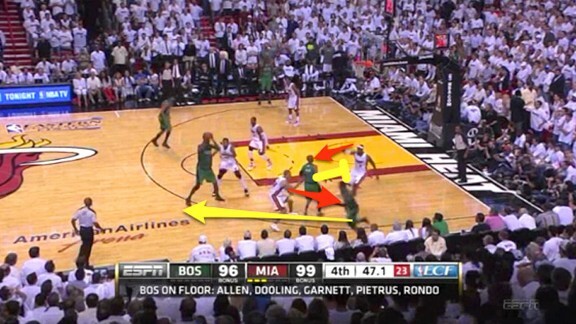 After Garnett sets the screen, he pops out with Rondo looking to pass to him. 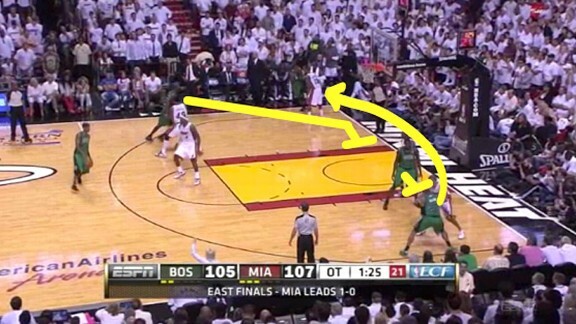 Dwyane Wade recognizes this, so he leaves his man, Dooling, and attempts to make the steal. Dooling does exactly what you teach a basketball player to do: If your man leaves you, run straight to the rim. If Wade makes that steal, the game is over, but his gamble doesn’t pay off. Mario Chalmers has to choose between defending his own man, Mickael Pietrus, at the 3-point line, or Dooling, who is cutting to the rim. He chooses Pietrus, allowing Dooling to get in the paint. As soon as Dooling makes the catch at the rim, James comes over to him and helps, which leaves Allen wide open at the 3-point line. Dooling quickly finds Allen, who knocks down the wide-open jump shot. Three Heat players make mistakes (Wade, Chalmers, and James), but everything is triggered by Wade’s failed steal attempt. Chalmers should have stunted toward Dooling, and James should have stayed on Allen, but Wade is more at fault, because without his error those two don’t happen. We pick up this play after another Garnett-Rondo hand-off. After he gives up the ball, Garnett heads right to the block to become the second screener in a double screen for Allen off of the basketball. 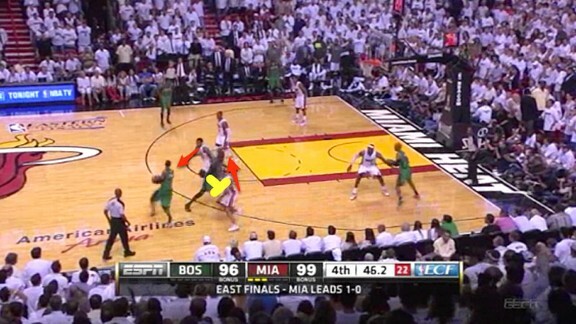 Battier, who is defending Allen, does a great job of getting around those screens. The Heat are intent on preventing Allen from beating them again. 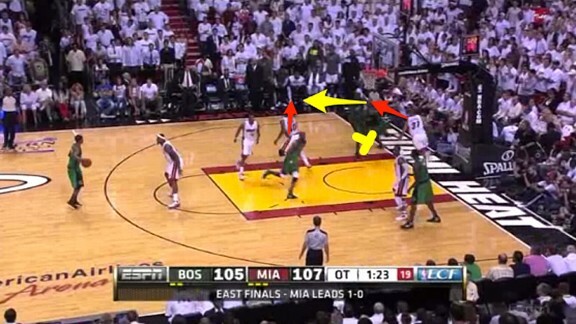 Thus, as Battier trails Allen around the screen, Haslem leaves Garnett to help contest Allen’s shot. Allen recognizes the double team quickly and and finds Garnett, who is open on the block. 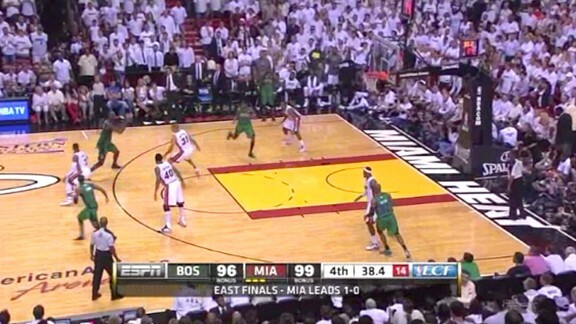 Wade has been guarding Brandon Bass, but he knows he needs to rotate over to Garnett. This time the Heat made all the right rotations, starting with Wade and finishing with Chalmers. 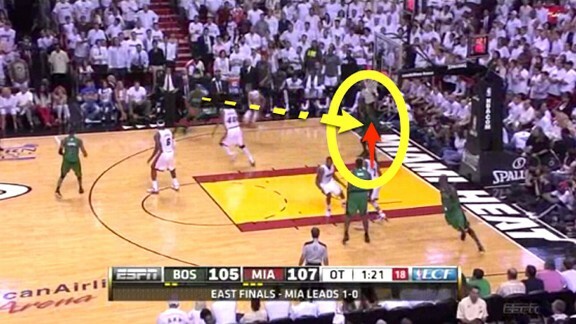 In the first play, Wade reacted outside of the Heat’s system, which left his teammates having to scramble. But when you make the right rotations, help will be there and the results will be more favorable.